Kiteboarding (Kitesurfing) for beginners, kitesurfing tips and tricks. Why this blog is for every kitesurfing beginner? Hi there! If your reading this, you’ve stumbled upon my little effort in de-mystifing the sport of kitesboarding. Kiteboarding is one of those sports which can be really hard for some people but very easy for others to pick up. If your finding it a little difficult then this site is for you. You’ll realize that a large reason why kiteboarding can be so difficult to learn has really nothing to do with you! I will be discussing everything from kitesurfing equipment to kitesurfing vacations to the psychology of kiteboarding. 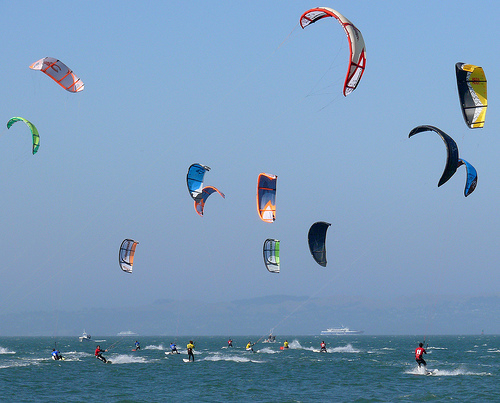 I hope this site grows into an information source and a community for kiteboarding beginners. Why am I doing this? Well kitesurfing (or kiteboarding) is complicated and I’d like to make it a little easier for people to understand and enjoy. Its also really expensive and reading this blog may save you a few 100’s of dollars! How do I get started kitesurfing?